Do the two photos in today’s post look familiar to you? I see it all the time in garage after garage. 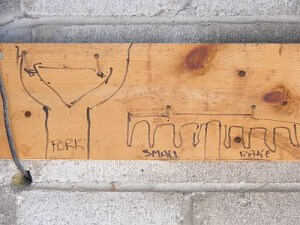 A board nailed to the wall with outlines of what tools hang where. And with that most of us would call it garage organization. Take a look at the first picture again, the one of the whole wall. What’s supporting that tool? A single nail? Someone brushes by it and the whole thing will fall down, possible scratching your car or worse causing some major damage to your kids. 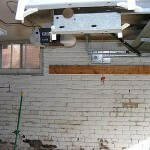 While this garage organization system might work for a few tools in a large garage where few people enter, it doesn’t work in a high-traffic zone that also acts as workshop, garden shed, and sports equipment storage. So what to do? Check out our next post to find out how installing a modular storage system can turn those little-thought-of walls into valuable and SAFE real estate.